Still doing some modifications but for the most part this is it!!!! Early Tail Rascal. I got lucky and it's not been spoiled with any taillight holes. The center hasn't even been cut for air cleaner clearance. I got the body, hood and windshield frame (glass is cracked) for $250. I saw the listing on Thesamba, and it was in southern Illinois. Called the guy and saw a few pics. Exactly what I was after. For the last 15 years I've had two disassembled 69 Beetle sedans. One was cut up for parts, the spine is ok, but rough. Lots of rust, some holes that need repaired. I always kept it with a buggy in mind. The other car has always been earmarked to get rebuilt. The spine is clean and solid. Once i got this Rascal home, I've been soul searching and looking at the parts. I'm ditching the Beetle build (I have a 73 Super that is my Beetle), and I'm going to use the good 69 spine for the buggy. I have a new set of German floor pans that will be shortened and fitted. Right now, everything is full size, and i have to research the best way to cut down the frame. The 73 Super is apart for painting and a new interior. It runs a GEX longblock at 1641cc. It's a mildly built stock engine that keeps the Beetle up to speed on the interstate. This is likely the first engine that will go in the buggy to get us playing and using it. I have 9 full engines and bare cases, including an 1800cc bus engine. Picked it up and hauled it home from Alto Pass, Illinois on December 4, 2010. It's here and I have it, so the pressure to get one is off. RIght now, it's waiting for room in the shop. I own PRO Stitch Auto Interiors and Upholstery, Inc. in Taylorville, Illinois, and always keep one corner free for the shop-sponsored project. Right now a 2008 Malibu is in the spot, but it's out the door in the next month or so. Hope to be shortening the frame and working on the body by Spring, 2011. PRO Stitch Auto Interiors and Upholstery, Inc.
Back in the mid-90s, I had purchased to Beetle Type I sedans and was in the process of deconstruction. I had read about Buggies and was curious, but never knew of any in Central Illinois. Wandering down an alley in Taylorville one day, I spied a very beat up and ransacked traditional style buggy body on a worn out frame. Months of effort to buy the hulk fell through when it was sold to another party on the morning I was to go and make my deal. Plans were put on hold but not forgotten. In early 2000's I swapped an interior build for a Pontiac Fiero. The customer's dad owned a rolling body and chassis and knew I was interested. His offer to sell it due to divorce came at a time when I had no stray cash laying around. Once again, almost but not quite. Forward to 2009, and the customer came in about other work. She missed her Fiero and was surprised I still had it. 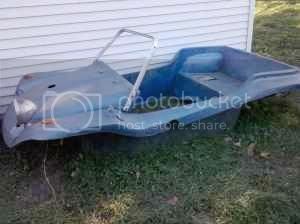 My offer: get her dad to swap me the buggy, and I'd give her her Fiero along with two additional parts cars. He wouldn't budge -- mad that I didn't buy a few years prior. By now I was wanting a buggy and started keeping an eye on E-bay. Just a month or so ago a quick trip to thesamba.com yielded the ad for the Rascal down in southern Illinois. This time, I didn't miss out and have the start to my project. Sponsor: PRO Stitch Auto Interiors and Upholstery, Inc.
1974 VW 1600 bored to 1915. Dual Del Orto's. Modified 1967 with early KP/LP frame head. 3" lift kit made of 2x3 steel tubing, tied to 6" wider front beam with 1.5" 120 DOM. Full perimeter cockpit cage, rear subframe, and engine cage of 1.5" .120 wall DOM also tied in to lift kit. 1776 with dual DCNF 42 Weber carburation. Bought in Feb 2004 and towed home. Sat for a year before complete disassembly. Next four years spent doing special fabrication and refitting pan and drivetrain components. Early 70's vintage body had over 100 holes drilled by previous owners that were filled in with fiberglass and restored to original condition without any holes. Street Legal and driven on or off the road. The orginal beetle was purchased in Victoria BC Canada in 1954 and driven by orginal owner until 1971. 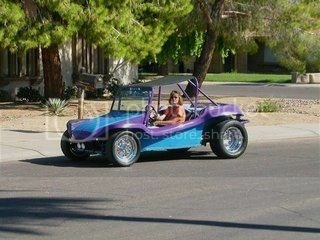 It sold but not registred and made into a Dune Buggy using an 1969 Rascal Kit. I bought it in 1999 and restored it in 2002 (becoming the second registred owner). Lots of fun, good off road vehicle. MINE! and it runs like a champ. A buddy at work had this and I told him to give me first crack if he ever wanted to sell it. He called this week (after 3 years) and offered to sell it. I bought it for $3700... so I SCORED! I had a Spatz with early Corvair suspension and home built frame, 140 hp engine and sold it a couple years ago after I started building this buggy. Wanting to build one with factory built Corvair frame for late model Corvair suspension. Sears Rascal body is more like a Meyers Manx and I like the rear fender area better than the Spatz. Has hydraulic clutch, cable throttle, full cage. Want to fabricate a bikini top for it to keep the sun off the head. Only VW parts are gas tank and turn signals on front. Has Corvair 140hp engine, rear suspension, Corvair CORSA tach and speedo.